Here is the latest round-up of cases from Blackpool Magistrates' Court. A joiner was over the alcohol limit when he drove to get a Chinese takeaway. Gareth Spendley, a 49-year-old father-of-three, of Beach Road, Cleveleys, pleaded guilty to driving with excess alcohol and having no MoT. He was disqualified from driving for 12 months and fined £250 with £85 costs plus £30 victims’ surcharge. Prosecutor, Martine Connah, said Spendley was stopped as he drove a Land Rover Freelander on North Drive, Thornton, on November 7, just before 10pm, after the car registered with police as having no MoT. Once he was in the police car an officer smelt alcohol on Spendley and a breath test showed 47 microgrammes of alcohol in his body - 35 is the limit. Robert Castle, defending, said his client had drunk very little that day and believed he was fine to drive the one-and-a-half mile round trip to get a Chinese takeaway. As a self-employed joiner the financial consequences of the driving ban would be severe for him. A 53-year-old Blackpool mother has admitted knowingly failing to get her children to school. Judith Cromer of Ansdell Road, South Shire, had previous convictions for the same offence the town magistrates court heard. Cromer’s 14-year-old daughter had thirty unauthorised absences and 13-year-old son had 62 absences. Cromer repeatedly failed to get in touch with the school authorities about the problem. She would not answer letter or phones calls or attend meetings. Cromer was given a year long community order during which she must attend 20 rehabilitation days .She must pay £185 costs. A 46-year-old Blackpool woman has admitted breaching the peace. Jacqueline Wagstaffe, 46, of Sutton Place,Blackpool, was bound over to keep the peace for six months in the sum of £50 for six months. The court heard that Wagstaffe was arrested after police were called to her home after her partner claimed she had threatened to knife him. She was so drunk police decided she needed to go into custody. A butcher working in Blackpool said he drove while he was banned from the road because there were no trains from the resort to get him home. Kawa Azizi, 27, of Fowler Heights Close, Blackburn, pleaded guilty to driving while disqualified without insurance or an MoT. 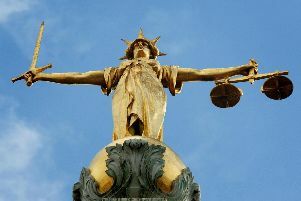 He was sentenced to a 12 months community order with 250 hours unpaid work for the community, banned from the road for 12 months and ordered to pay £85 costs with £85 victims’ surcharge. Prosecutor, Peter Bardsley, said police stopped Azizi as he drove a Peugeot on Preston New Road, on October 23 at 9pm, because the car was registering as having no MoT. Checks then revealed he was a banned driver and he had a previous conviction for driving while disqualified four months previously in June. In a report to the court probation officer Gillian O’Flaherty told magistrates that Azizi said he had leant to drive in Iran but had not taken test in the UK since moving here in 2011. Gerry Coyle, defending, said his client worked as a butcher in Blackpool and the day of the offences he had been stranded as the train services from the resort were stopped. Azizi, who helped care for his girlfriend who was recovering from a back injury, was anxious to get back to her and a friend lent him a car. A woman alleged to have taken part in an anti fracking protest appeared before Blackpool Magistrates Court via a video link from Exeter. Esme North, 25, of Totnes, Devon, is said to have taken part in the protest outside the Cuadrilla gas exploration site at Little Plumpton, Preston New Road. She is charged using a lock on device on the A583 which could cause danger or injury. At court was her co-accused David Eaton,45, who faces the same allegations. District Judge Jane Goodwin heard that their cases could not go ahead as material such as statements and CCTV had not been served by the Crown Prosecution Service on defence solicitors. The duo were bailed until their trial takes place on February 25 next year.